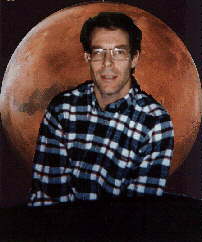 On Thursday night, science fiction writer Kim Stanley Robinson said he was happy to be giving a talk in his hometown at the Davis library, in the Blanchard Room. It’s a room he associates with happy memories since he is a regular at the library’s famous used-book sales. He buys books by the grocery bag, takes them home, and tries to recycle as many so he has room in his library. “I’ve got a perpetual motion machine going on,” he said. Robinson said he is a Californian – “not quite by birth but as long as I can remember.” His early years in Orange County shaped his future. “I grew up in a science fiction novel,” he said, referring to the destruction of nature he witnessed in Orange County. He watched orange groves, avocado ranches and eucalyptus borders were bulldozed and torn out at a rate of five acres a day for 10 years. “Ordinary literature describes the present and quickly becomes historical,” Robinson said. “If you want to write with the emotions of how life feels, you need to write science fiction. Orange County taught me this in advance of everyone else. “Science fiction writers will be looked to in the future for emotional descriptions of what it was like in the last 30 to 40 years,” he predicted. Robinson said he discovered science fiction (any story set in the future) in college and it was like a light bulb going on in his head. During that time, in the early ‘70s, there was a term for the changes society was going through – future shock. But we don’t use that term any more, he said. We have no need for it because we’re used to changes. Robinson and his wife, Lisa, and their two sons, now 17 and 11, live in Village Homes. He loves Davis and has accomplished the bulk of his professional writing here. He thinks of the destruction of Orange County when he hears about the university’s plans to expand the campus westward and build a faculty housing village on what are now open fields. “I love Davis but I feel landscape-deprived,” he said. Robinson says his fellow writers laugh at him – in a good way – because he always writes with a green slant, with a love of nature and wilderness. “By now I am a walking cliché,” he said. But he is a true believer. Robinson says he works outside whenever possible. His climate-change novels came about precisely because he felt that society was beyond surprise. What did that leave a science fiction writer to write about? Nature. His most recent three novels are “Forty Signs of Rain,” “50 Degrees Below,” and “60 Days and Counting,” which is coming out in March. Robinson, who earned his Ph.D. in literature at UC San Diego, loves long 19th century novels. He describes the three climate change books as a novel in three volumes, like a Victorian triple-decker. -- Reach Elisabeth Sherwin at gizmo@dcn.org and watch for more local writers to be featured biweekly at this web site. the October 30, 2006, PRINTED MATTER column.